You just found out you are pregnant, and now you are wondering whether or not your are carrying twins. Not that most women wonder this, the curiosity or fear is usually sparked by comments such as, “Wow! Are you sure you’re not carrying twins, you seem big for how pregnant you are.” While it is important to refrain from slapping this innocent person upside the head from making such a comment, there are a number of indicators that you might experience physically that could give you an inkling as to whether or not the bundle of joy is going to be a double whammy. With that said, here are some of the first signs of twin pregnancy. Obviously the first thing to consider is weight gain, take for granted that is what sparks the comments to begin with. When you are pregnant there is a certain amount of weight your doctors expect you to gain during your pregnancy, typically that is 20 to 25 pounds. Most of that weight will come in the last trimester. However if you are carrying twins, then by the time you are in your second trimester you will already be at about 20 pounds with an entire trimester to go. If you are measuring large for your gestational age then you could be carrying twins. However, if this isn’t your first pregnancy then measuring farther along then what you are is normal. So while you may be in your first trimester and already having difficulty getting into your normal clothes, if this is your second or third child this is normal. Disappointing and frustrating, but normal. While it would be great if morning sickness was only a symptom if you were having multiples, it isn’t. Most women that are pregnant experience morning sickness, and the severity is really going to vary by each individual woman. I had little none with my first, I was sick the entire time with my second, and this third one has made even the thought of eating make me sick. All of which were and will be single births. While the medical community may not back up that women carrying multiples will experience fetal movement early then a woman that is only carrying one, many moms claim that they have felt movement earlier in their pregnancy then they should have. Again, if you are a very thin women you are going to notice fetal movement early, also if this is your second or third pregnancy you are going to notice movement early. 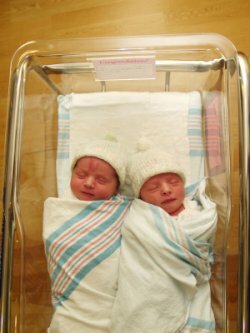 This is one test that your doctors will perform that can be an early indication of twins or triplets that goes beyond observations by well meaning passers-by or self scrutiny. Alphafetoprotein measures a protein that is secreted by the fetal liver. If there is more then one baby on board then the protein level in the mom’s blood will be high. This high result will typically lead to an ultrasound to rule out any abnormalities with a single baby and confirm that there is more then one. Nurturing a growing baby drains your energy, if you are carrying two or more then you are more likely to be positively exhausted. If you are a first time mom you might be easily inclined to think that this is just what pregnancy is. Fatigue is normal, but you should still be able to function and feel slightly revived after a short nap. Talk to your doctor, pay attention to just how fatigued you are. Multiple births are not the only reason for extreme fatigue when you are pregnant, but it can be a good indication. You are going to notice an increase in appetite while you are pregnant anyway, that is because your body is going to feed baby first and you last. Most women are not aware they are carrying twins until the second trimester when their body is screaming and crying out for food. Erase from your mind that you are eating for two or three, you are eating for you so that your body remains healthy enough to sustain and grow the precious little ones that are growing inside you. Many people make the assumption that in order to have twins, that there has to be a history of twins in the family. My dear, there is a first for everything. Talk to your doctor about the symptoms you are having, don’t rule anything as “just apart of being pregnant” and taking that to be normal. The alphafetoprotein is one test the can do, ultrasounds are also important, but a simple Doppler done in the doctor’s office that reveals dual heartbeats will also tell you whether or not you are carrying twins. Congratulations on your pregnancy! Whether you are carrying one or more then one may you enjoy all the wonders that pregnancy and motherhood are about to bring you.